Online poker and casino penny auction site Bidibot.com has already awarded some amazing prizes this holiday season, and there’s still much more to come, including a whopping $2,000 cash auction bundled with 1000 bids this weekend. 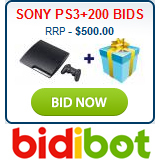 Recent auctions have seen Bidibot users walk away with a PlayStation 3 bundle for just $1.45, an iPod Shuffle for just $1.40, and a Nintendo Wii plus 400 bids for an incredible $4.30. To keep the holiday festivities rolling, Bidibot will be continuing with 50 cent bids and amazing daily auctions right up until December 31st. Designed for online poker and casino players, Bidibot auctions casino and poker credits that players pick up for literally pennies. Every day – and at this time of year in particular -- Bidibot also auctions consumer electronics as well as some of the most up to date games on the market. With a newly redesigned homepage, new partners, new features and new products, there’s never been a better time to get involved - especially while the site is offering 100% extra free bids with any bid pack purchased. Other new features recently implemented on Bidibot.com include a ‘Refer a Friend’ reward program, a questionnaire offering five free bids to all participants, and new restrictions to make sure all users – new and experienced - have a fair chance to win. Details of all the amazing prizes and promotions on offer over the holiday season are available at Bidibot.com.